So what can it be that has teachers upset, on several levels, and is described as something that parents wont like, students wont like, “older” school principals wont like and school boards like ? Notice that there would hardly be anyone left to actually like this upcoming change. I became aware of this from an article in the Daily Advance newspaper today in which Dept of Public Instruction representative(1) Tamara Ishee-Berman warned local school board members of the possibility of public displeasure over what she called a method of learning math that focuses on problem solving skills and not doing math problems. She provided an example where students at the N C School of Science and Math were told they would be city planners designing a new mass transit system for their town. She related that a key element of the new learning approach would involve students choosing what equations they needed to solve the problem without teacher imput. The method which she described as revolutionary would be used to teach middle school students.The method is also described as one that requires great initiative on the part of students. So, here we have a radical new system which will admittedly be painful to be taught by teachers who will lack adequate learning time and will place added demands on principals and what result do we expect ?Hint, it wont be pretty. Just one more thought. Who had input into this program and were the potential pitfalls even considered. I am quite glad I do not have any children in the public schools but alas I do have grandchildren that are there. 1 Footnote: Ms Ishee-Berman is regional lead at the N C Department of Public Instruction and has degrees from University of Massachusetts Boston and Harvard. Name Calling or Am I Really a Freak? Based on a couple of things I have recently read, I am a freak, hate intellectuals and am just downright ignorant. I may be even worse than that since those characterizations come from just two sources. A brief elaboration on the intellectual comment. Not only do I hate intellectuals but I probably don’t even want to associate with them since there is no room for them in the Republican Party, or so says Chris Matthews. Oops, I wasn’t supposed to mention his name. Should I not quote him as saying that Rick Perry is a clown? I realize that politicians have to accept a certain level of name calling as part of the territory but I so wish that those in the media who make their living with their words, could describe a candidate or office holder without the use of epithets. This applies to both ends of the spectrum since both are guilty of using this tactic and I just cannot stand it. It reminds me of one of my #1 pet peeves, tearing down another to make oneself look good. I could probably be called lots of things but I am relatively certain that freak is not one of them. That was the name applied to Rep Louie Gohmert just a few weeks ago. and it has been amplified with the word crazy among others. And, since I like the congressman, while not always agreeing with him, guess I am a freak by association. So, is there a cure for this political name calling? I really doubt it since the practice is time-honored in American politics as far back as he days of George Washington. In fact, the names used to describe some of our earlier presidents were generally far more creative than those used today. In fact, if I hear another conservative called Nazi, I think I might have a fit. What makes this epithet so abhorrent to me is the person using the name has got to know better, He or she has to know what Nazis did and i daresay that none of those so described have done things to equal those. So, the next time you see fit to “attack” a politician, try to use an appropriate word. I am a regular viewer of the ESPN show, Pardon the Interruption or PTI as it is known.The program is co-hosted by Michael Wilbon and Tony Kornheiser. The program consists of the aforementioned gentlemen good naturedly arguing and/or discussing sports and sports related issues. I have long enjoyed the show and in particular those times when their discussions meshed sports and non sports issues. Of course, there is an inherent risk in that approach.One could actually postulate on issues well beyond one’s expertise. From my point of view that is exactly what took place on a segment that aired on either Thursday or Friday of last week. The segment was set up with the question about what person one would like to see on a postage stamp. Mr Wilbon launched his answer with a boisterous comment that “stamps are irrelevant.” At that point, I no longer cared about the rest of their ” discussion” since Mr Wilbon had ( in my mind) cast aspersions on my profession. As a letter carrier, stamps are an integral part of what I do and I heard his statement as yet another example of bashing the postal service and sort of dismissing us completely. 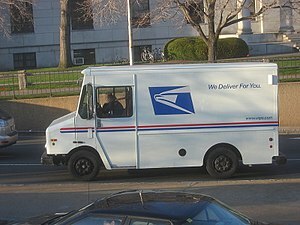 Dismissing the postal service dismisses its employees as well. From my perspective, we are not totally outmoded and outdated and ready for the scrap heap. Try this thought on for size. People often complain about so-called junk mail, particularly if it is unsolicited. There is an analogy in the internet world known as spam. Which of these two, if opened, can potentially ruin your computer and potentially compromise your identity? Hint, it isn’t a letter. A more learned source puts it this way. A recent study in the Journal of Marketing discovered that mail is the most effective means of direct advertising and is even considered less intrusive. Truly amazing, huh? Just one last thought. This comes from a recent Verizon commercial that actually gave me a warm feeling. A person dashes to their mailbox at the end of the driveway and upon opening the door discovers a box from Verizon with their eagerly anticipated cellphone. It is hard to top the excitement of receiving that long-awaited or even expected letter or package in one’s mailbox. For me it sure beats that unexpected email. 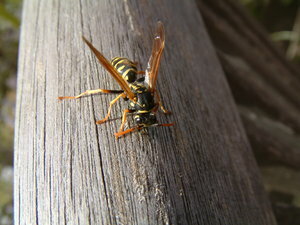 Those who know would call our title subject a hornet, which along with its associate the verspula germanica or wasp; is one of the little known objects of Hurricane Irene”s wrath. And even though I am one of those who had incurred their wrath at various times ( since I suffer from a pronounced allergic reaction to their stings) I feel a duty to come to their defense. We in North Carolina suffered significant damage from Irene although ours was not as widespread as that in some northeastern states. Hard to tell that to the residents of Hatteras though. One species that was significantly affected was those of the stinging variety. The combination of wind and water wreaked havoc on their nests and in the words of the N C Division of Public Health may have caused them to be very aggressive as a result. That’s a real no brainer, huh? Come on, if your nest was waterlogged and then blown several hundred feet from its preferred location, you might be in a bad mood also. So, for a while give these guys a wide berth and please, if at all possible, avoid using the Raid.